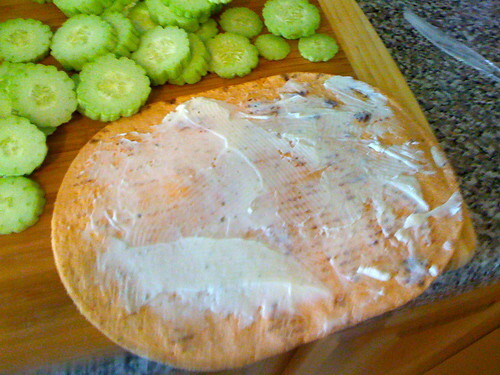 Eat 3-course, 300-calorie meals of “forbidden food” and lose up to 5 pounds a week. Be sleek and slinky. Buckle into a beautiful new beltline. 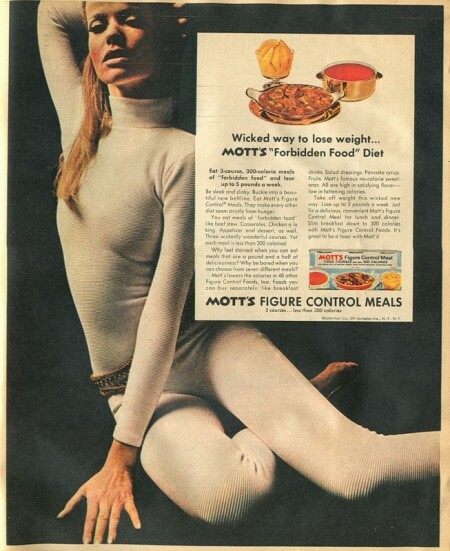 Eat Mott’s Figure Control Meals. They make every other diet seem strictly from hunger. You eat meals of “forbidden food” like beef stew. Casseroles. Chicken a la king. Appetizer and dessert, as well. Three wickedly wonderful courses. Yet each meal is less than 300 calories! Why feel starved when you can eat meals that are a pound and a half of deliciousness? Why be bored when you can choose from seven different meals? Mott’s lowers the calories in 48 other Figure Control Foods, too. Foods you can buy separately, like breakfast drinks. Salad dressings. Pancake syrup. Fruits. Mott’s famous no-calorie sweetener. 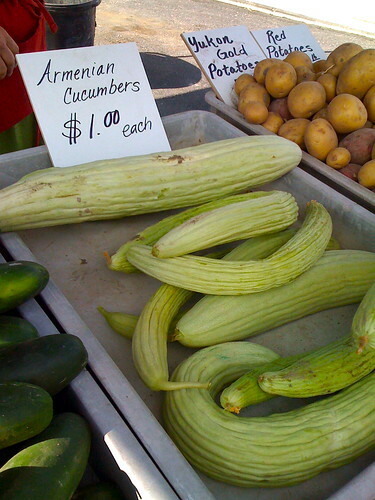 All are high in satisfying flavor – low in fattening calories. Take off weight this wicked new way. Lose up to 5 pounds a week. Just fix a delicious, convenient Mott’s Figure Control Meal for lunch and dinner. Slim breakfast down to 300 calories with Mott’s Figure Control Foods. It’s great to be a loser with Mott’s! I’ve found in the world of processed food, you can only have two out of these three options: low in calories, large serving size or tastes good. If something is low in calories and tastes good, then it MUST be a small serving. If something is a large serving and tastes good, then it MUST be high in calories. If something is low in calories and a large serving, then it MUST taste like cardboard. Mott’s brags about their Figure Control Foods being low in calories and “a pound and a half of deliciousness.” I know that all three are impossible, so what was it? Were they really delicious? Were they really low in calories? Were they really a large serving? I never got to try them, so I’ll never know, but I suspect that they might have been exaggerating the “deliciousness” of their three course meals. Sometimes, getting five servings of fruits and vegetables is difficult. Sometimes it feels like a chore to eat that many. When I start feeling like that, I break out the Bloody Mary glasses and make myself a Virgin Bloody Mary. Wet the lip of the glass and dip it into the margarita salt. Add ice, V-8, Tabasco sauce and lime juice to the glass and mix well. Grind some pepper on the top of the liquid. You can also add olives and celery, but I usually don’t have those sitting around my house when I’m in this situation, so I just drink it with a straw. For some reason, dressing tomato juice up like this makes drinking my serving of vegetables a little easier. It makes me feel like I am having a treat. I had never heard of freezing grapes until about five years ago. We had just moved into our present house and the back yard had grape vines. We had so many grapes that there was no possible way for us to eat them all. A friend of mine recommended that we freeze them. Put all the ingredients into the blender and mix on high until smooth. 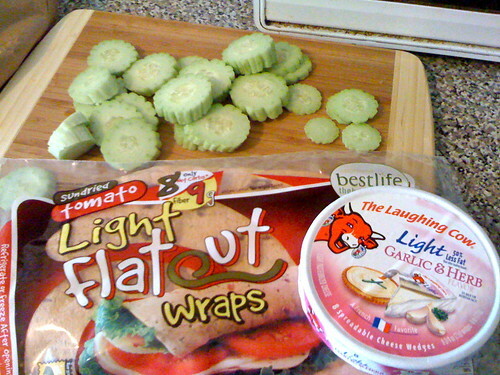 1 serving – Approximately 250 calories – 5 WW Points – 2 fruit, 2 oil and 1 milk serving. 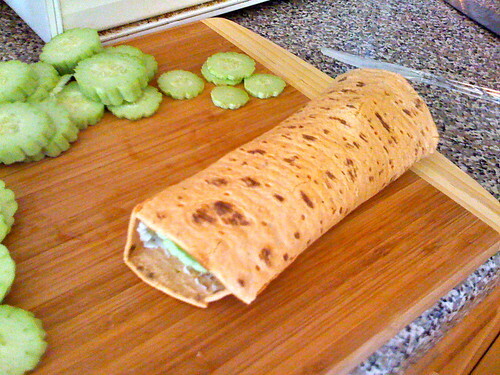 Without frozen grapes, eating healthy would be much more difficult for me. 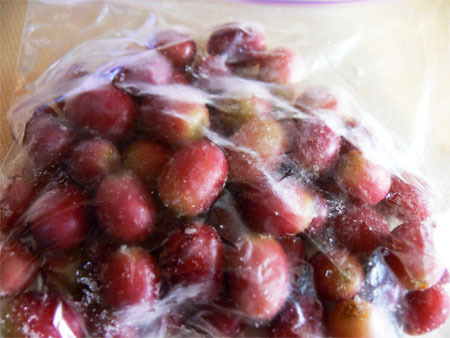 If you are having a hard time getting all your fruit servings in, get a bunch of grapes today and freeze them in one cup bags today. Then all you need to do each day is take out one bag and you knock out two servings in one punch. I have been racking my brain trying to think of easy things to cook just like the Mexi-Beans and the Italian Beans. This week, I came up with this one. 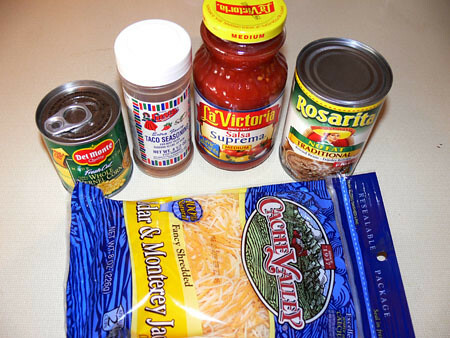 Open the can of refried beans and divide among the three bowls. Drain the can of corn and divide among the three bowls. Open the bottle of salsa and divide between the three bowls. This is ALOT of salsa, so if you’re sensitive to spiciness, make sure you choose the mild. 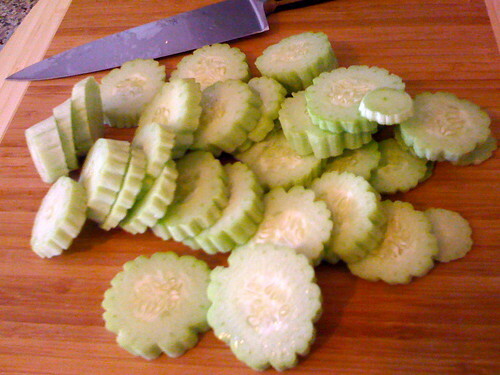 Add 1 tsp of Mexican seasoning to each bowl. 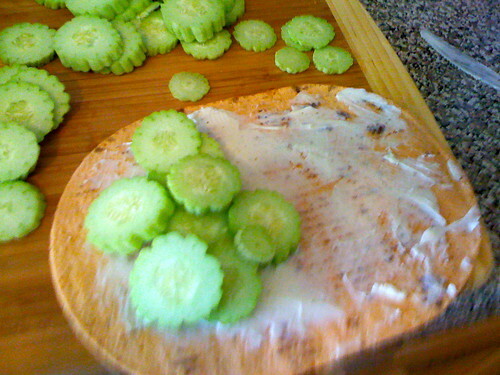 You can also spice it up with Tabasco sauce, taco sauce packets from Taco Bell, etc. 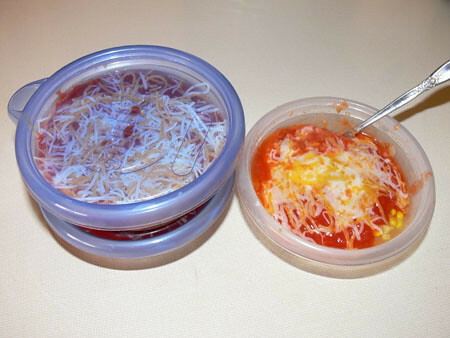 Add 1/4 cup shredded cheese to each bowl. I usually heat one up immediately (only takes one minute when everything is at room temperature) and then store the other two for later. I count this as one protein, one dairy and two veggies. It’s a little more points than Mexi-Beans, but it’s a nice change of pace so I don’t get bored eating the same thing all the time. I love Mexi-Beans and they are a great way to get me back on track eating healthy, but the problem is, I get sick of them REALLY easily. Earlier this week, I couldn’t bear the thought of eating another bowl of them, so I desperately ravaged my cupboard in an attempt to find anything that would give me two servings of vegetables and one serving of protein. 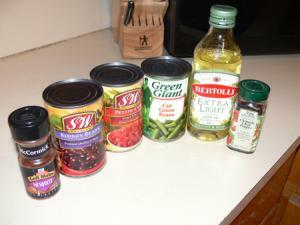 I created Italian Beans and here is the recipe. 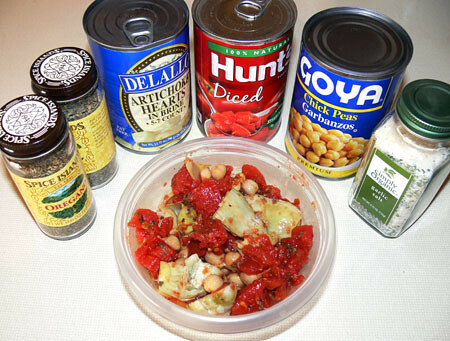 Pour the can of garbanzo beans into one of the Glad bowls. Fill the bowl with water and gently rinse the beans. Drain the water and divide the beans between the three bowls. Drain the can of artichoke hearts. Divide the beans evenly between the three bowls. Add 1 tsp of garlic salt, 1/2 tsp of oregano and 1/2 tsp of basil to each bowl. If you want to finish off your oil requirement for the day, add 2 tsp of olive oil to each bowl (it will add 2 points to this recipe). If you notice, the recipe is just as easy as Mexi-Beans, but it tastes completely different so I’m not sick of it. Additionally, I can stock up on the ingredients for this recipe and store them in the cupboard (or downstairs in food storage) for a long time. I love knowing that I have something tasty in the cupboard that just needs me to open three cans and we can eat. 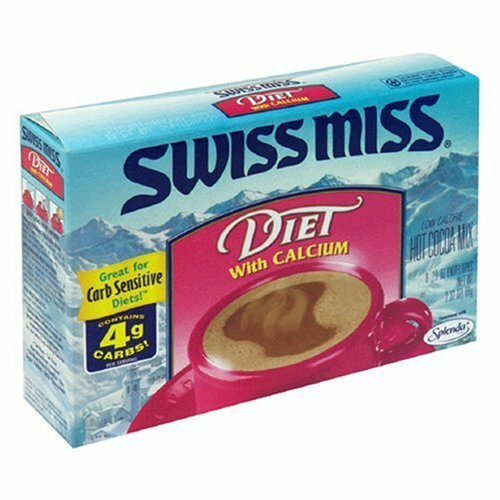 When Swiss Miss came out with their Swiss Miss Diet Cocoa, everyone at Weight Watchers were excited about it. Whenever someone mentioned an indulgence, the Swiss Miss Diet Cocoa jumped into the conversation. I tried it. It was good, but I still have almost a full box of it sitting in the cupboard. Because I like REAL cocoa. Plus, I have a hard time eating my two servings of dairy every day, so if I’m going to have cocoa, I’m going to make it WORTH it. Set your microwave to 50% power. Microwave your milk in a heat-safe mug for three minutes. If you don’t reduce your microwave cooking power level, the milk will bubble up and make quite a mess in your microwave, so make sure you reduce your cooking level to 50%. Once the milk is heated correctly, stir in the teaspoon of cocoa and the packet of Stevia. You have to stir in a little more with real cocoa than you would if you were using a packet of Swiss Miss. 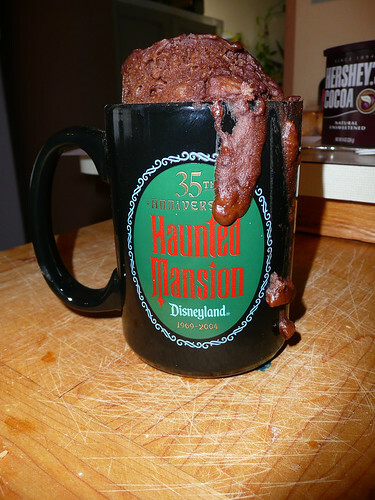 Make sure all the lumps of cocoa are mixed in. The reason why Swiss Miss is so popular is because you don’t need to have milk with you to make it, so if you’re in an office, all you have to do is get some hot water from the water cooler. With a little planning, however, you can have cocoa that tastes like REAL chocolate and do your body some good.